Nvidia is bringing the first hand held gaming device featuring Android Jelly Bean to users. 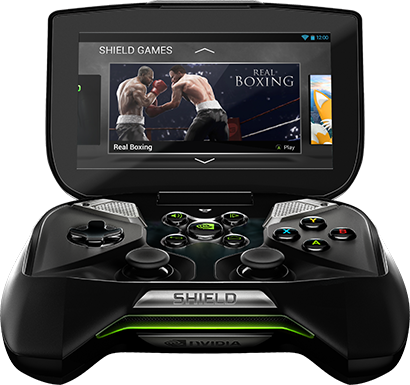 Called the Shield, the hand held gaming console will ship for $299.00 (Rs.17000.00). The Nvidia Shield comes with a 5 inch retinal quality touch screen display which runs on a 720p resolution. It will run on a stock Android Jelly Bean ROM and have a custom 72 core NVIDIA GeForce GPU with a quad core ARM A15 CPU. The Shield also packs a custom tuned bass reflex audio. From the image above the controller looks real cute and the whole package looks like a space ship kind of thing. The Shield will come with Google Play preloaded hence you don't to worry to much about the titles. It also comes with a complete infotainment package shown below. And further you can stream your PC games over Wi-Fi to play anywhere in the house. With always-on access via Wi-Fi to Google Play and NVIDIA TegraZone™ libraries, the Shield will offer you gaming, music, books, videos, magazines TV shows, Facebook and Twitter through the 5 inch display.